The data stored in a Hadoop cluster is often confidential, so it is important to ensure that your data is safe from unauthorized access. Many companies decide to deploy the Hadoop cluster to a separate network, behind firewalls. The sections below provide some suggested ways to make sure that RapidMiner Radoop can connect to these clusters. 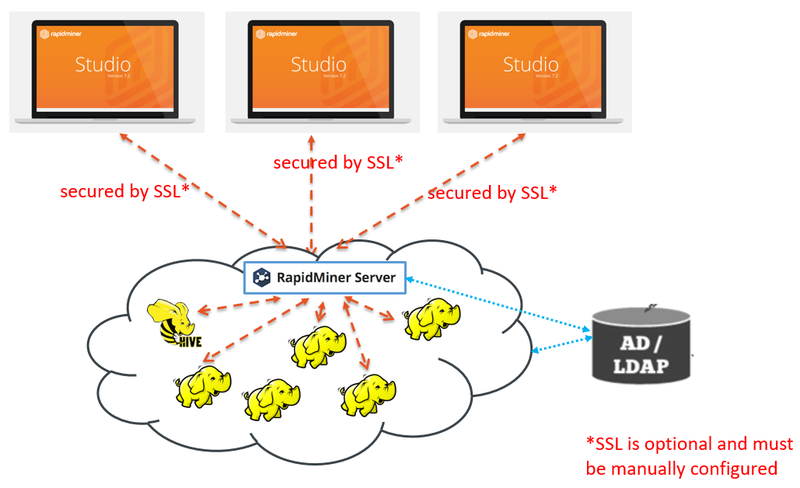 Note: You must have a fully functioning Hadoop cluster before implementing RapidMiner Radoop. Hadoop cluster administrators can use the following tips and tricks, which are provided only as helpful suggestions and are not intended as supported features. To operate properly, the RapidMiner Radoop client needs access to the following ports on the cluster. To avoid opening all these ports, we recommend to use Radoop Proxy, the secure proxy solution shipped with RapidMiner Server. See details on Radoop Proxy below. HDFS NameNode 8020 or 9000 Required on the NameNode master node(s). ResourceManager 8032 or 8050 and 8030, 8031, 8033 The resource management platform on the ResourceManager master node(s). JobHistory Server Port 10020 The port used for accessing information about MapReduce jobs after they terminate. DataNode ports 50010 and 50020 or 1004 Access to these ports is required on every slave node. Hive server port 10000 The Hive server port on the Hive master node; use this or the Impala port (below). Impala daemon port 21050 The Impala daemon port on the node that runs the Impala daemon; use this or the Hive port (above). yarn.app.mapreduce.am.job.client.port-range property on the Connection Settings dialog. RapidMiner Radoop automatically sets the version-specific default ports when you select a Hadoop Version on the Manage Radoop Connections window. These defaults can always be changed. If you can access the ports on your cluster from the RapidMiner Radoop clients, you can skip this section. The following options describe some ways to secure these ports and make sure that only the RapidMiner Radoop clients can access them. The following steps set up a tunnel and create a SOCKS proxy on the client — the SOCKS proxy is for Hadoop APIs, the tunnel is for the Hive/Impala JDBC connection. Select two free ports above 1024 on the local client computer. 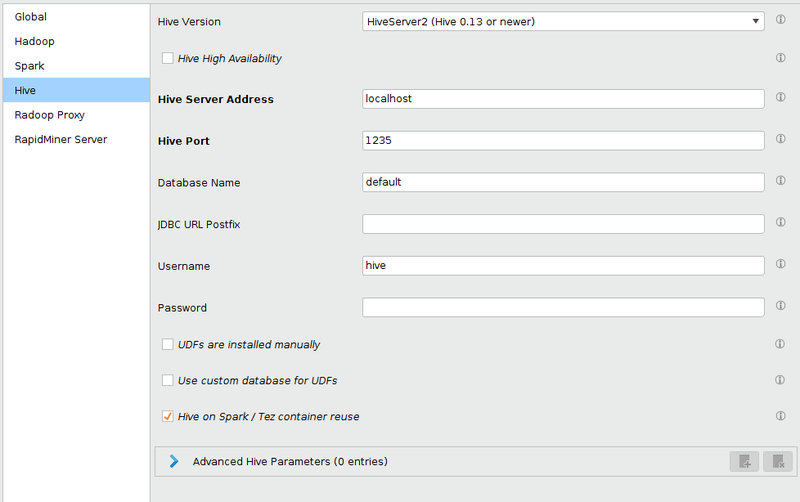 This example uses ports 1234 and 1235 as the free ports and 10000 for the Hive Server port. Optionally, you can add a second tunnel for Impala. Create a SOCKS proxy on port 1234. Set up an SSH tunnel from the local port (1235) to the Hive Server node port (10000). If you plan to additionally use Impala, add a third tunnel from local port 1236 to an Impala node port (default 21050). Open your SSH application. This example uses the free SSH client PuTTY and the sample port numbers from above. Add 1234 as a Dynamic forwarded port. Add hive-internal-address:10000 as the Destination. The SSH tunnel must remain running for as long as you are using RapidMiner Radoop with the remote cluster. To keep the tunnel open, set the Seconds between keepalives property on the Connection panel in PuTTY to a value greater than zero (for example, 60 seconds). Add impala-internal-address:21050 as the Destination. To set up SSH on a Linux-based system, run the following commands from the terminal. These examples use the sample port numbers from above (1234 and 1235). If you are using a private key for authentication, add -i /path/to/private.key. The SSH tunnel must remain running for as long as you are using RapidMiner Radoop with the remote cluster. To keep the tunnel open, set the ServerAliveInterval in ~/.ssh/config. Typically, an interval of 60 seconds between keepalive requests is sufficient. Note that you can set ServerAliveInterval in the system-wide config file, a user config file, or on the SSH command line (with the -o option). If you also want to use Impala, add an additional tunnel. The RapidMiner Radoop connection, when using SOCKS proxy and SSH tunneling, requires additional configuration settings. From the Connections menu, select Manage Radoop Connections. Click the Configure button from the Manage Radoop Connections window to open the Connection Settings dialog. NameNode Address Enter the private hostname/IP address of the HDFS master node. Resource Manager Address Enter the private hostname/IP address of the YARN master node. NameNode port Defaults to Hadoop value; no change needed. Resource Manager port Defaults to Hadoop value; no change needed. Click OK and Save to save this connection. Click the Quick Test button to test the connection. If the test is successful, you have properly set up a secure connection to your Hadoop cluster. An alternative method for bringing your client node into a private network is to define a Virtual Private Network (VPN). To do so, refer to the OpenVPN documentation or consult with your network administrator for further details. After defining the VPN and connecting your client computer to it, you can access all the necessary Hadoop ports from the client; there is no need for further configuration. If you have Hadoop nodes that are not protected within a private network and are not isolated from the Internet, you must protect your data with proper firewall settings. Because a Hadoop cluster usually consists of many nodes, and the services on one node communicate with other services on other nodes, if there is a firewall, all those service ports must be open. A common practice is to open all ports among Hadoop nodes within your cluster. In addition, you must open the required ports for all RapidMiner Radoop clients. Note that these settings can become complicated and difficult to maintain as you add more nodes to your cluster. It is preferable to organize all Hadoop nodes into a private network, as described in the section on SOCKS proxy. Radoop Proxy makes the networking setup significantly simpler, in this case the only port that needs to be open for Radoop clients is the port that the Proxy listens on. This port is configured during RapidMiner Server installation and has a default value of 1081. For configuring a Radoop Proxy for a Radoop connection in Studio, check the guide Configuring Radoop Proxy Connection. For customizing the installation in Server, see Custom Radoop Proxy installation section in the Server documentation.